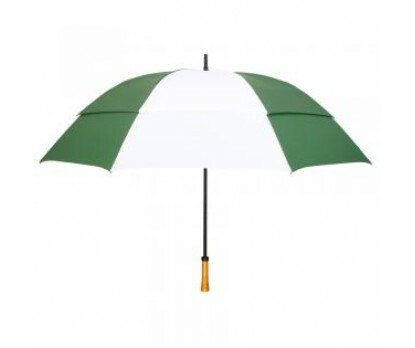 Logoed promotional hunter green & white 64” arc vented golf umbrellas are the common sight during golf season. Hunter green and white is closely synchronizes with bright green golf turf over, which the game is conducted. Custom hunter green & white 64” arc vented golf umbrellas are usually sought by sports manufacturers and leading sports accessories suppliers to position their brand. This manual open umbrella cuts a very distinctive mark due to its features wooden handle, windefyer vented canopy, nylon fabric canopy and fiberglass frame. Personalized hunter green & white 64” arc vented golf umbrellas can be employed during any harsh weather conditions because it stays upright against strong gusts of wind. Imprint area - 10"W x 5"H. Dimensions - 64" arc - Closes to 42". Available Colors : Navy, Black, Black/White, Hunter/White, Black/Red, Royal/White, Navy/White, Evergreen/White, Navy/Khaki, Hunter/Khaki, Purple/White, Red/white. Product Size : 43.31" x 9.06" x 11.81"